Description: The Nifty Station Wagon is the very first Little People playset that was sold with a family: Dad, Mom, Baby, and dog. The station wagon itself marks an era in American history where wooden-side station wagons were the "family" car of choice. The station wagon/convertible makes an engine "brr-rumm-brr-rumm" sound and it has a happy smiling face with 2 eyes on the front grill that roll up and down as the toy is pulled. The 2 back seats have a mechanism to make the passengers spin when the toy is pulled. The wooden tailgate can be lowered and the roof is make out of 3 separate pieces of white plastic that allows child to change this station wagon into a convertible. Due to it's age and limited 2 year production, this set is quite hard to come by. The small white plastic convertible top frames are even harder to find than the figures that were sold with the set. The mom and dad figures were also used in 1961's #984 Safety School Bus, but the baby and dog are exclusive to this set. B234 - Red wooden Nifty Station Wagon with wooden side panels lithographs and a white front bumper and grill with eyes that move up and down as the car rolls. The car rolls on 4 black wooden wheels with white painted hub caps/wheels. Sold with a removable roof and 2 roof support pieces. Measures 13-1/2" long, 4-1/2" high, 5-1/4" wide. 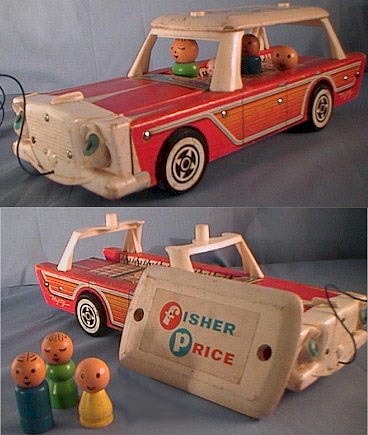 FPT609 - White rectangular wooden convertible roof with a paper litho on top marked "Fisher Price" in red and blue. Each end of the roof has a round hole to connect the roof support pieces. Measures 6-5/8" long, 3-3/4" wide, 3/8" thick. 2 each - FPT610 - White plastic roof support that attach to the B234 Nifty Station wagon and supports the FPT609 roof. The roof support has an E-shaped top piece and support legs on each side. The top piece has an upright peg in the center to connect to the FPT609 roof and each support leg has a peg on the bottom to connect to the B234 Nifty Station wagon. Measures 4-3/8" wide, 1-3/4" thick, 2-1/2" high. 4 wooden people - Taller and wider than regular straight-sided people. AAWW - Blue dad with a very thin circle cut into base about 1/3 up, closed eyes, triangle mouth, dot nose, slightly curled brown heat-stamped hair. *See Variations below. KMWW - Green mom with a depression around the waist to form hips and bust, closed eyes, dot nose, triangle mouth, black heat-stamped hair. *See Variations below. HLWW - Yellow baby with no hair, dot eyes, crooked smile, no nose, body tapers from about 1/3 up to the neck. HNWW - Black dog with white eyes and a dot on the nose, white plastic ears, body tapers from about 1/3 up to the neck, with 2 thin circles around the body at about 1/3 and 2/3 up base. Made in the early sixties ('60-'62), and made of all wood only. Used on #234 set only. Made in the early sixties ('60-'62), and made of all wood with plastic droopy ears. Used on #234 set only. KLWW - The dad could also have no ring around the base. KKWW - The dad could also have black heat-stamped hair opposed to brown. FRWW - The mom could also have red heat-stamped hair opposed to black.